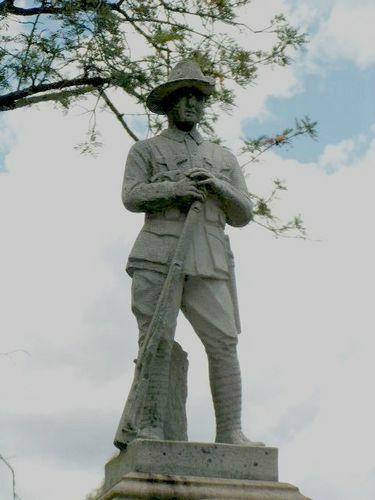 The Mount Alford War Memorial contains a 'digger' statue which is the smallest on a war memorial in Queensland. It commemorates those pupils from the school and those of the district who had enlisted in World War One. The unveiling of the memorial statue to the pupils of the Mount Alford School and also those who had enlisted from that centre was performed in the school grounds on Saturday by Mr J.D. Story (Under Secretary for Education). Mr Story, who was introduced by the chairman of the school committee (Mr T W Lightbody), paid an eloquent tribute to the brave boys at the front and to the noble mothers who had given of their best. Visitors from all parts of the district were present. The tablet on the monument contains 29 names.